Southeast wall of Undirhlíðar quarry exposes the TDP lithofacies association: Tuff unit intruded by a Dike that feeds an overlying Pillow lava flow. Project Overview and Goals: This six-student project focuses on the construction of a subglacial pillow ridge on the Reykjanes Peninsula in southwest Iceland. It builds on a series of recent projects in which we have investigated the internal architecture of a single volcanic ridge as it is exposed in two quarries: Undirhlíðar and Vatnsskarð. Our observations have identified transitions in eruption behavior (explosive-effusive), shallow magma transport networks, and within-ridge changes in mineralogy and geochemistry (Pollock et al., 2014). The targeted field site for the proposed project is the ~3 km-long area between Undirhlíðar and Vatnsskarð and the ~1 km extension of the ridge north of Undirhlíðar. Work in this region will allow us to connect the lithostratigraphy between the two quarries and investigate how lava is distributed along and across the ridge structure, and how the distribution system may change as it approaches the ridge margin. We will also examine how eruption morphologies vary with changing magmatic conditions and emplacement pressures. Student projects will focus on understanding the physical volcanology, geochemistry, and petrology of the lithofacies identified. Exposures along the top of the ridge and in gullies between the two quarries will be specifically targeted for field mapping and description. Volcanic segments in Iceland (after Jakobsson and Gudmundsson 2008). Box indicates study site in the Western Volcanic Zone (WVZ) on the Reykjanes Peninsula. B. Geologic map of Iceland showing location of field site on the Krisuvik fissure system. C. Locations of Undirhlíðar and Vatnsskarð quarries. The proposed field site for this study is the region between and north of the quarries. Also note the location of Helgafell, a nearby glaciovolcanic edifice. Geologic Background: Pillow lavas are one of the most common types of lava morphologies on Earth (Walker 1992), yet the emplacement dynamics of pillow lavas are not well understood simply because of their relative inaccessibility; the vast majority of pillow lavas form in deep submarine (e.g., Walker 1992; Batiza & White 2000; Johns et al. 2006; Furnes et al. 2007) or ice-confined environments (e.g., Jones 1969; Jones 1970; Hoskuldsson et al. 2006, Edwards et al. 2009). For pillow lavas formed in glaciovolcanic eruptions, most models propose a single period of effusive pillow formation within an englacial lake followed by a transition to entirely explosive eruptions as water depth shallows (e.g., Jones 1970; Allen et al. 1982; Hickson 2000; Pedersen & Grosse 2014). These models were largely developed based on fieldwork at Pleistocene glaciovolcanic deposits, which are now exposed due to Holocene ice retreat at many locations in western Canada (Mathews 1947; Allen et al. 1982; Edwards et al. 1994; Moore et al. 1995; Hickson et al. 1995; Hickson 2000; Edwards et al. 2009), Antarctica (e.g., Smellie & Skilling 1994; Smellie et al. 2008), and especially in Iceland (van Bemmelen & Rutten 1955; Sigvaldasson 1968; Jones 1969, 1970; Allen, 1980; Hoskuldsson et al. 2006; Pedersen & Grosse 2014). However, recent observations of glaciovolcanic pillow exposures in Iceland (Pollock et al. 2014) and British Columbia (Edwards et al. 2009) show packages of pillow lavas separated by fragmental volcanic material. These observations indicate that the general model for glaciovolcanic, pillow-dominated eruptions needs to be further tested and revised. The Western Volcanic Zone on the Reykjanes Peninsula in southwest Iceland is broken into several en echelon NE-SW-trending volcanic segments (Jakobsson et al. 2008). Eruptions along the volcanic segments during the late Weichselian produced glaciovolcanic ridges that, today, protrude through post-glacial lava fields. The glaciovolcanic ridges are composed of fragmental volcanic material and pillow lava, which has been exploited as a building material. As a result, several active and inactive quarries exist on the peninsula. Two of these quarries, Undirhlíðar (inactive) and Vatnsskarð (active) have been the targets of a three-year project currently funded by NSF. The proposed site for this study is the ~3 km-long area between Undirhlíðar and Vatnsskarð and the ~1 km extension of the ridge north of Undirhlíðar. This area offers many water-carved gullies that expose the glaciovolcanic deposits and can be easily accessed via a hiking trail that runs along the length of the ridge. The exposures between the quarries will allow us to investigate how Undirhlíðar and Vatnsskarð are related, to address the overarching question of how magma is distributed along the ridge structure. The exposures north of Undirhlíðar will allow us to understand glaciovolcanic processes as they occur at the margins of the volcanic edifice. In addition, the northern part of the ridge is adjacent to Helgafell, a glaciovolcanic ridge of similar age but dominated by fragmental deposits (Schopka et al. 2006). A comparison of findings from Helgafell and the ridge north of Undirhlíðar will allow us to study the overarching question of how emplacement pressure and magmatic conditions control eruptive morphology, and provide constraints on changes in paleo-ice thicknesses on the Reykjanes Peninsula. Estimates of emplacement pressures – Students will estimate paleo-ice and paleo-water thickness by measuring H2O in glasses from pillow lava and volcaniclastic units by FTIR. Previous FTIR analyses have been conducted in Dr. Sheila Seaman’s lab at UMass Amherst. Magma distribution through dikes – Students will map the occurrence and orientations of dikes between the quarries. They will use major and trace element geochemistry and petrography to compare their dikes to intrusions from the quarries and south of the quarries to test whether dikes could be transporting magma along the ridge axis. Magma distribution through MCJBs – In our investigation of Vatnsskarð, we observed massive columnar jointed basalts (MCJB) that we interpreted as irregularly shaped intrusions. MCJBs may be related to the local shallow plumbing structure. Students will map the occurrence of MCJBs and conduct a geochemical and petrographic investigation to determine their origin and the role they may play in distributing magma within the pillow edifice. Geochemistry and Petrography – Students will map lithostratigraphic units and collect samples for geochemical analysis. Students will conduct major and trace element analysis of the units to use for correlation between the quarries. Students will also explore how magmatic conditions (e.g., depth of crystallization, variations in melt source or degree of melting) change during the construction of the pillow ridge. Pillow lava morphology – Students will measure lava morphological characteristics, such as pillow lava diameters, thickness of glass rims, and trend and plunge of pillow tubes. They will measure pillow size distributions within lithostratigraphic units on corrected Gigapan images. Students will study correlations between pillow morphology and controlling factors using data from emplacement pressures and geochemistry. Logistics/Field Conditions: We will spend ~2 weeks in June conducting fieldwork in Iceland, focusing on detailed mapping of lithostratigraphic units, measurements of lava morphological characteristics, and collection of samples for geochemical analysis. Applicants should be aware that fieldwork in Iceland can be rugged, wet, and cold. Participants are expected to be prepared with complete rain gear and field gear (i.e., boots, daypack, etc.) appropriate for fieldwork in such conditions. Fieldwork will include hiking in steep terrain. A valid passport is required for this project because of travel to Iceland. After fieldwork is complete, we will spend the remainder of the time (~2 weeks) at Wooster preparing samples for XRF, ICP-MS, FTIR, and thin sections. Recommended Courses/Prerequisites: This project is suited for rising seniors with an interest in Volcanology, Igneous Petrology, High-Temperature Geochemistry, and Mineralogy. Work from this project must continue into the senior year (2016-2017) as a senior thesis (or equivalent). Suggested, but not required, courses are Mineralogy, Petrology, Structure/Tectonics, Geochemistry, and Volcanology. Pillow lavas separated by yellow, palagonitized hyaloclastite, exposed in cross section. Allen, C.C., 1980. Icelandic subglacial volcanism: Thermal and physical studies. Journal of Geology 88, 108–117. Allen, C.C., Jercinovic, M.J., Allen, J.S.B., 1982. Subglacial volcanism in North-Central British Columbia and Iceland. Journal of Geology 90, 699–715. Edwards, B.R., Skilling, I.P., Cameron, B., Haynes, C., Lloyd, A., Hungerford, J.H.D., 2009. Evolution of an englacial volcanic ridge: Pillow Ridge tindar, Mount Edziza volcanic complex, NCVP, British Columbia, Canada. Journal of Volcanology and Geothermal Research 185(4), 251-275. Edwards, B., Perpalaj, A., Pollock, M., Hiatt, A., Reinthal, M., Silverstein, A., Hauksdottir, S., 2014. Overview of the mineralogy and geochemistry of pillow lavas and dikes exposed at Vatnsskarth, Iceland: insights on physical and chemical processes at tindar ridges. In EGU General Assembly Conference Abstracts , Vol. 16, p. 15345. Furnes, H., de Wit, M., Staudigel, H., Rosing, M., Muehlenbachs, K., 2007. A vestige of Earth’s oldest ophiolite. Science 315, 1704-1707, doi:10.1126/science.1139170. Head, J.W., Wilson, L., 2003. Deep submarine pyroclastic eruptions: Theory and predicted landforms and deposits. Journal of Volcanology and Geothermal Research 121(3-4), 155-193. Hiatt, A., 2014. Estimated hydrostatic/cryostatic pressures during emplacement of pillow lavas at Undirhlithar quarry, Reykjanes Peninsula, southwest Iceland. Undergraduate thesis, 46 pp. Hickson, C.J., Moore, J.G., Calk, L.C., Metcalfe, P., 1995. Intraglacial volcanism in the Wells Gray-Clearwater Volcanic Field, East-central British Columbia, Canada. Canadian Journal of Earth Science 32, 838–851. Hickson, C.J., 2000. Physical controls and resulting morphological forms of Quaternary ice-contact volcanoes in Western Canada. Geomorphology 32, 239–261. Höskuldsson, A., Sparks, R.S.J., Carroll, M.R., 2006. Constraints on the dynamics of subglacial basalt eruptions from geological and geochemical observations at Kverkfjöll, NE-Iceland. Bulletin of Volcanology 68, 689–701. Jakobsson, S.P., Johnson, G.L., 2012. Intraglacial volcanism in the Western Volcanic Zone, Iceland. Bulletin of Volcanology 74,1141-1160, doi: 10.1007/s00445-012-0589-x. Jakobsson, S.P., Gudmundsson, M.T., 2008. Subglacial and intraglacial volcanic formations in Iceland, Jokull 58, 179-196. Johns, S.M., Helmstaedt, H.H., Kyser, T.K., 2006. Paleoproterozoic submarine intrabasinal rifting, Baffin Island, Nunavut, Canada: volcanic structure and geochemistry of the Bravo Lake Formation, Canadian Journal of Earth Sciences 43(5), 593-616. Jones, J.G., 1970. Intraglacial volcanoes of the Laugarvatn Region, Southwest Iceland, II. Journal of Geology 78, 127–140. Jones, J.G., 1969. Intraglacial volcanoes of the Laugarvatn Region, Southwest Iceland, I. Journal of the Geological Society of London 124, 197–211. Mathews, W.H., 1947. ‘Tuyas,’ Flat-topped Volcanoes in Northern British Columbia. American Journal of Science 245, 560-570. Moore, J.G., Hickson, C.H., Calk, L.C., 1995. Tholeiitic-alkalic transition at subglacial volcanoes, Tuya Region, British Columbia, Canada. Journal of Geophysical Research 100, 24577-24592. Papale, P., Moretti, R., Barbato, D., 2006. The compositional dependence of the saturation surface of H2O + CO2 fluids in silicate melts. Chemical Geology 229 (1-3), 78-95. Pedersen, G.B.M., Grosse, P., 2014. Morphometry of subaerial shield volcanoes and glaciovolcanoes from Reykjanes Peninsula, Iceland: effects of eruption environment. Journal of Volcanology and Geothermal Research 282, 115-133. Pollock, M., Edwards, B., Hauksdottir, S., Alcorn, R., Bowman, L., 2014. Geochemical and lithostratigraphic constraints on the formation of pillow-dominated tindars from Undirhlithar quarry, Reykjanes Peninsula, southwest Iceland. Lithos (200-201), 317-333. Schipper, C.I., White, J.D.L., Houghton, B.F., 2010. Syn- and post-fragmentation textures in submarine pyroclasts from Lo’ihi seamount, Hawai’i. Journal of Volcanology and Geothermal Research 191, 93-106. Schopka, H.H., Gudmundsson, M.T., Tuffen, H., 2006. The formation of Helgafell, southwest Iceland, a monogenetic subglacial hyaloclastite ridge: Sedimentology, hydrology and volcano-ice interaction. Journal of Volcanology and Geothermal Research 152(3-4), 359-377. Sigvaldason, G.E., 1968. Structure and products of subaquatic volcanoes in Iceland. Contributions to Mineralogy and Petrology 18, 1-16. Silverstein, A., Pollock, M., Edwards, B., Hiatt, A., Perpalaj, A., Reinthal, M., 2014. Constraints on emplacement depths and eruption dynamics for pillow lavas from quarries in southwestern Iceland. Geological Society of America Abstracts with Programs, 46, 6, 576. Smellie, J.L., Skilling, I.P., 1994. Products of subglacial volcanic eruptions under different ice thicknesses: Two examples from Antarctica. Sedimentary Geology 91, 115-129. Smellie, J.L., Johnson, J.S., McIntosh, W.C., Esser, R., Gudmundsson, M.T., Hambrey, M.J., van Wyk de Vries, B., 2008. Six million years of glacial history recorded in volcanic lithofacies of the James Ross Island Volcanic Group, Antarctic Peninsula. Palaeogeography Palaeoclimatology Palaeoecology 260, 122-148. Soule, S.A., Fornari, D.J., Perfit, M.R., Rubin, K.H., 2007. New insights into mid-ocean ridge volcanic processes from the 2005-2006 eruption of the East Pacific Rise, 9o46’N-9o56’N. Geology 35(12) 1079-1082. Van Bemmelen, R.W., Rutten, M.G., 1955. Tablemountains of Northern Iceland (and related geological notes). Brill Archive. Walker, G.P.L., 1992. 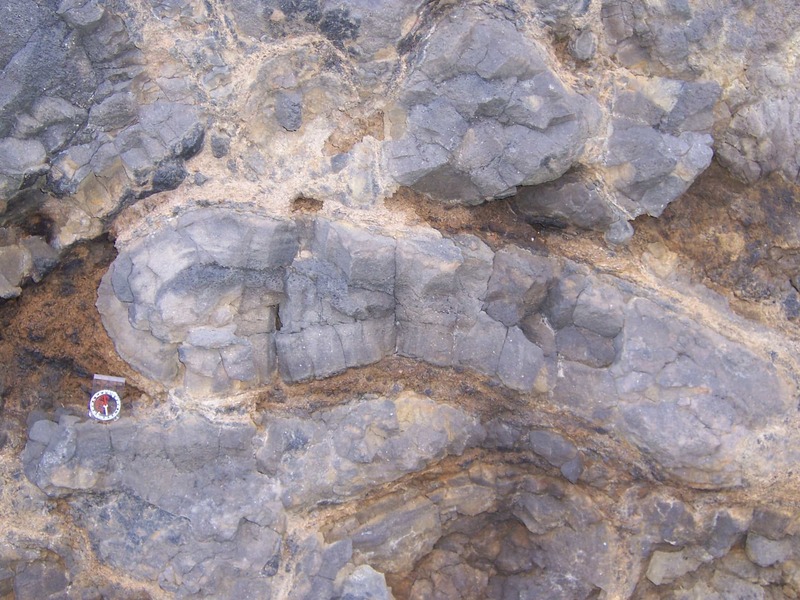 Morphometric study of pillow-size spectrum among pillow lavas. Bulletin of Volcanology 54(6), 459-474.